Dust & Ashes at Charlotte Pride Free admission. Aug. 20, 3:45 p.m. Held in Uptown. www.charlottepride.org. For Charlotte-based Americana/folk band, Dust & Ashes, the Bible has been a muse. The band's name was taken from scripture — specifically from Job 42:6, where Job says, "I despise myself and repent in dust and ashes." But the trio is far from religious in the sense of ancient law. Heather Himes, the vocalist/guitarist who fronts the quartet — also comprised of Alea Tuttle (vocals, banjo, viola, saw), Leah Smith (vocals, cello, standup bass) and Tiffany Goodman (vocals, percussion) — says there's good and bad connotations to the name and its meaning to the band, some of whom are gay. It's complicated, but it's about learning to love and accept oneself. "It's a form of self recognition and a little bit of self-loathing, but also a repentance of being that and also thinking it," Himes said. Himes, who is gender non-conforming and uses femme pronouns, grew up in Kershaw, South Carolina, where being gay was considered a sin as much as it was socially unacceptable. Despite Himes' non-religious status, she sports two tattoos, both of Jesus. Himes eventually left town, finding a home and a thriving LGBTQ community in Charlotte by way of Plaza Midwood. It's the opposite of her non-progressive hometown, which she feels is moving in the wrong direction. But what about House Bill 2 and its impact on North Carolina? While she admits it may look as though the Q.C. is moving backwards on paper, it's another story in artsy refuges like Plaza Midwood and other parts of the city and surrounding area. 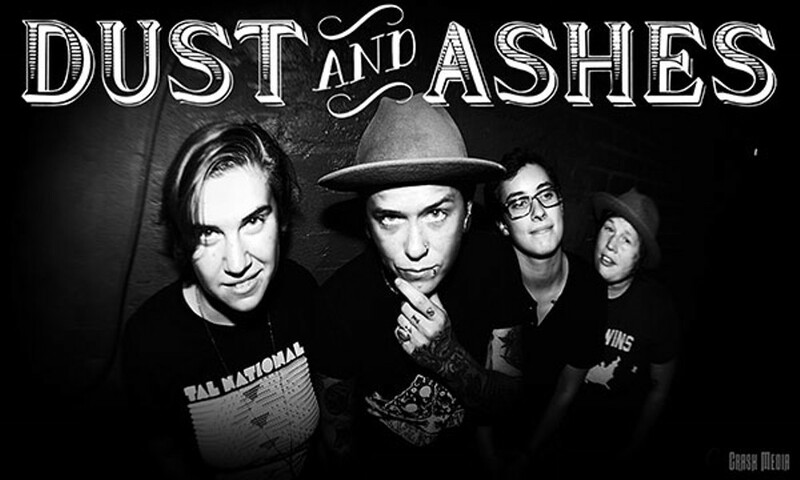 Dust & Ashes will perform at Charlotte Pride on the Wells Fargo stage on Aug. 20. Himes enjoys playing the festival, which she dubs as a great place to people-watch. "I think that's the best thing about Pride. It used to be much more flamboyant and lots of banana hammocks and now you see more families and a lot more families and a lot of straight people, so it's kind of changed but in a good way and it's still people-watching," she says. "It's cool to see how it's becoming way more normal to people which technically is what it should be." In regards to recent controversy surrounding the trans community and a lack of representation at the festival (see this week's news feature), Himes chimes in with her thoughts. "I actually think that's probably a legit opinion. I have gone to Charlotte Pride for a couple years and I don't think they have huge representation," she says. "But I do think that like, the community in general, the reason that's just now starting to happen for them, it'd be hard to knock Pride and say they don't have a forum. I think they are just starting to grow into that forum." This Charlotte Pride appearance marks Dust & Ashe's second time playing during the LGBTQ shenanigans. Last year, they performed during the release of their debut studio album, Bone To Pick. Since then, the band has been honing its sounds and has reworked some of the songs on the album. They are slated to release a sophomore album that will be recorded live in the fall. Often described as playing "swamp stomp," the band's music falls into genres like Americana and folk, as well as blues and Appalachain and Louisiana styles. "It's very Southern, but it's not really country," says Himes, who is heavily influenced by former local Scott Avett and his successful Avett Brothers outfit. Most recently, Dust & Ashes opened for Oh Pep!, an Australian indie folk-pop duo who played The Evening Muse. During the set, Oh Pep! had to borrow Himes' guitar. "I'm never going to wash it now," she said with a laugh. Since that Charlotte show, the band has trotted off to Portland, Oregon, where they've played nine shows and are attending The DreamRoll, an all-ladies moto-camping festival. On Aug. 17 they'll play Ink Floyd's God Save the Queen City at Snug Harbor with Landless and T. Hardy Morris & The Hardknocks. On Sept. 24, Dust & Ashes will perform a concert series with other local bands/musicians that takes a stand against HB2 at Neighborhood Theatre. It's a cause that the group stands behind and it's fitting for a band that's members aren't shy about their sexuality. Songs like "Redneck Dyke" reminisce over Kershaw inhabitants and a lack of acceptance in that community. Himes, who says that folks often think the song is about her, says it is actually about a lady from Kershaw who was a role model of sorts to her. Other songs like "Queen Betty" and "Have Heart" are reminders of the importance of speaking up and standing up for what you believe in, as well as loving yourself for who you are and not what others want you to be. The track "Exit Plan" circles back to Himes, her tattoos and the home and community that she grew up in, with its Bible-belt feel. Oftentimes, Himes would rant, runaway and even cut up dresses that her mother wanted her to wear. "I felt trapped in this idea of who I was supposed to be as a kid and feeling completely isolated and rejected because I already knew who I was," said Himes. "I was gay and that was not OK with my parents and with God."